The AGM-65 Maverick is a tactical, air-to-surface guided missile designed for close air support, interdiction and defense suppression mission. It provides stand-off capability and high probability of strike against a wide range of tactical targets, including armor, air defenses, ships, transportation equipment and fuel storage facilities. Maverick was used during Operation Desert Storm and, according to the Air Force, hit 85 percent of its targets. The Maverick has a cylindrical body, and either a rounded glass nose for electro-optical imaging, or a zinc sulfide nose for imaging infrared. It has long-chord delta wings and tail control surfaces mounted close to the trailing edge of the wing of the aircraft using it. The warhead is in the missile's center section. 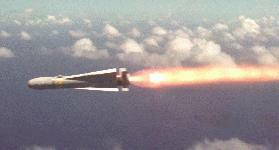 A cone-shaped warhead, one of two types carried by the Maverick missile, is fired by a contact fuse in the nose. The other is a delayed-fuse penetrator, a heavyweight warhead that penetrates the target with its kinetic energy before firing. The latter is very effective against large, hard targets. 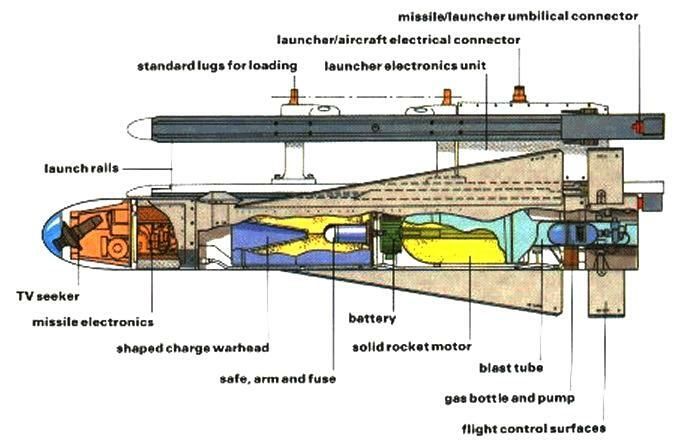 The propulsion system for both types is a solid-rocket motor behind the warhead. A-10, F-15E and F-16 aircraft carry Mavericks. 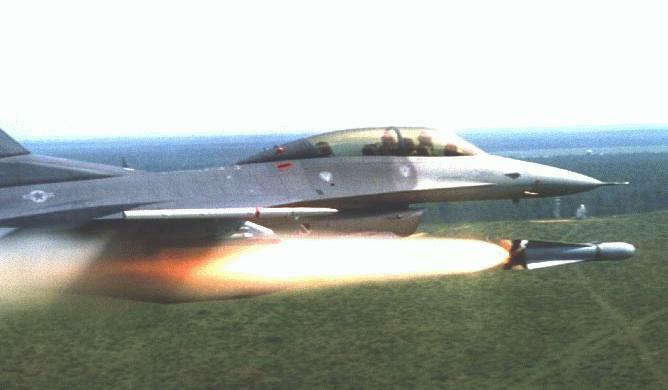 Since as many as six Mavericks can be carried by an aircraft, usually in three round, underwing clusters, the pilot can engage several targets on one mission. The missile also has "launch-and-leave" capability that enables a pilot to fire it and immediately take evasive action or attack another target as the missile guides itself to the target. Mavericks can be launched from high altitudes to tree-top level and can hit targets ranging from a distance of a few thousand feet to 13 nautical miles at medium altitude. The Maverick variants include electro-optical/television (A and B), imaging infrared (D, F, and G), or laser guidance (E). 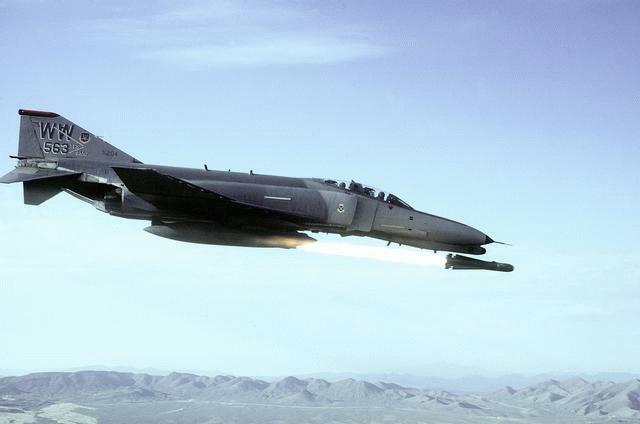 The Air Force developed the Maverick, and the Navy procured the imaging infrared and the laser guided versions. 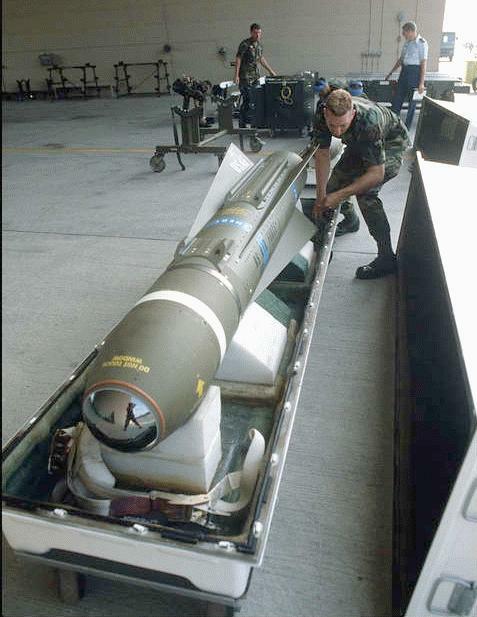 The AGM-65 has two types of warheads, one with a contact fuse in the nose, the other a heavyweight warhead with a delayed fuse, which penetrates the target with its kinetic energy before firing. The latter is very effective against large, hard targets. 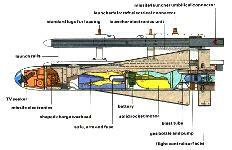 The propulsion system for both types is a solid-rocket motor behind the warhead. Maverick A has an electro-optical television guidance system. 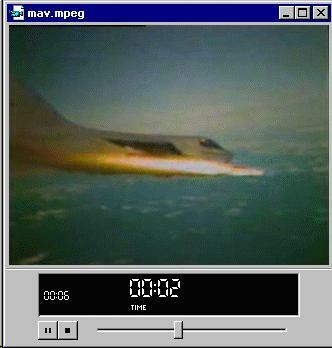 After the protective dome cover is automatically removed from the nose of the missile and its video circuitry activated, the scene viewed by the guidance system appears on a cockpit television screen. The pilot selects the target, centers cross hairs on it, locks on, then launches the missile. The Maverick B is similar to the A model, although the television guidance system has a screen magnification capability that enables the pilot to identify and lock on smaller and more distant targets. The Maverick D has an imaging infrared guidance system, operated much like that of the A and B models, except that infrared video overcomes the daylight-only, adverse weather limitations of the other systems. The infrared Maverick D can track heat generated by a target and provide the pilot a pictorial display of the target during darkness and hazy or inclement weather. The Maverick E is being adopted in the AGM-65E version as the Marine corps laser Maverick weapon for use from Marine aircraft for use against fortified ground installations, armored vehicles and surface combatants. Used in conjunction with ground or airborne laser designators, the missile seeker, searches a sector 7 miles across and over 10 miles ahead. If the missile loses laser spot it goes ballistic and flies up and over target -- the warhead does not explode, but becomes a dud. The Maverick F AGM-65F (infrared targeting) used by the Navy has a larger (300 pound; 136 kg) penetrating warhead vice the 125 pound (57 kg) shaped charge used by Marine and Air Force) and infrared guidance system optimized for ship tracking. The Maverick G model essentially has the same guidance system as the D, with some software modifications that track larger targets. The G model's major difference is its heavyweight penetrator warhead, while Maverick A, B and D models employ the shaped-charge warhead. 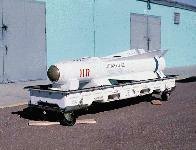 The Air Force accepted the first AGM-65A Maverick in August 1972. A total of 25,750 A and B Mavericks have been purchased by the Air Force. 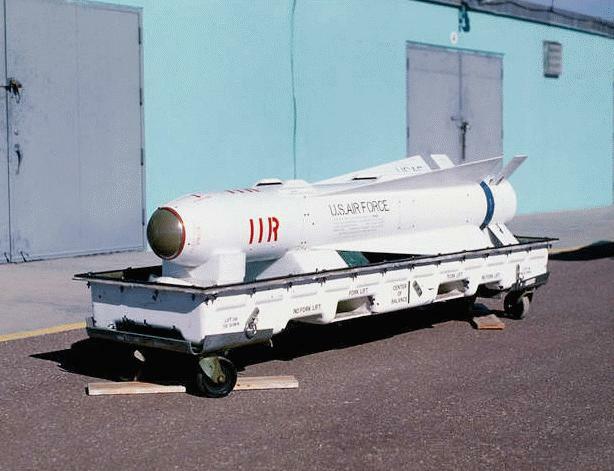 The Air Force took delivery of the first AGM-65D in October 1983, with initial operational capability in February 1986. 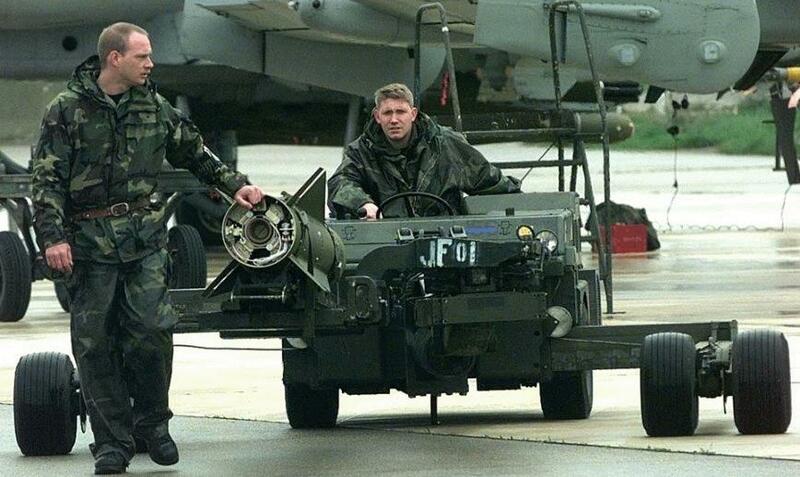 Delivery of operational AGM-65G missiles took place in 1989. AGM-65 missiles were employed by F-16s and A-10s in 1991 to attack armored targets in the Persian Gulf during Operation Desert Storm. Mavericks played a large part in the destruction of Iraq's significant military force. TV Mavericks have been experiencing declining reliability and maintainability since exceeding their 10 year shelf life over 10 years ago. The Depot purchased a lifetime buy of all spare parts for TV Mavericks in FY88 and those parts are running out. Due to funding shortfalls, the Depot has ceased to repair AGM-65A Maverick missiles and concentrates on maintaining AGM-65B, AGM-65D, and AGM-65G Maverick missiles. 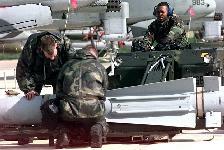 The U.S. Air Force and Raytheon have worked out an intricate arrangement to upgrade electro-optically-guided AGM-65 air-to-ground Maverick missiles through reuse of hardware on older Mavericks. The upgrade is intended to extend the service life of the AGM-65 through the use of a charge coupled device (CCD) seeker. Operational benefits of the CCD include greater reliability and the ability to operate in lower light levels. The AF put together a plan to buy about 2,500 missiles but was unable to fund the program. As a result, it scaled back its procurement plans to about 1,200. Also, Raytheon proposed an exchange program in which it reuses parts of older Mavericks to reduce the cost of the improved Mavericks. The two-part agreement calls for Raytheon to buy old missiles and guidance and control sections from the AF. The main portion of the program calls for Raytheon to buy back guidance and control sections of some of the 5,300 IR-guided AGM-65Gs the AF bought after the 1991 Persian Gulf War. The IR seekers have six cards that are common with the CCD and are reused. The CCDs then are mated with the center aft section of the missiles that were earlier stripped of their IR seeker. The new missile will be known as the AGM-65K. 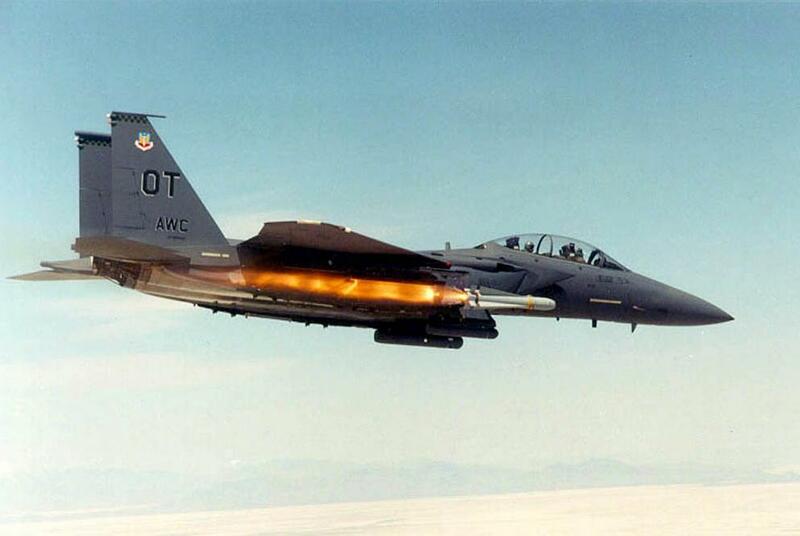 The AF first considered a CCD upgrade using AGM-65Bs to make AGM-65Hs. Those missiles have a 125-pound warhead. But the conversion program taking AGM-65Gs - which have a more powerful 300-pound warhead - and making them into AGM-65Ks will be lower cost. Raytheon will use IR seeker parts not needed by the CCD for foreign military sales customers. Although some of the IR seeker would have to be newly built, the reuse of some hardware will make the total seeker less expensive than it would have been otherwise. The second part of the AGM-65K program involves Raytheon's procurement of up to 1,000 of about 7,000 AGM-65As that have been in cold storage. This became necessary because Raytheon's Maverick airframe supplier was getting out of the business, even though Raytheon still receives foreign orders for new missiles. After detailed analysis and disassembly of six missiles, the cold storage AGM-65As were deemed to be as good as the day they were built. The missiles are corrosion coated inside and out, and not just on the outside like newer Mavericks. The arrangement calls for the US Government to receive about $2,150 per missile. Raytheon takes the missile apart and returns those items that need to be demilitarized, such as the warhead, to the government. The government pays disposal costs which would have been incurred anyway. Because Raytheon disassembles the missile, the government saves about $500 to $1,000 per unit. 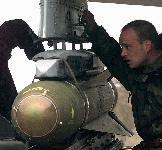 The approximately $2.1 million the government will receive will go towards the AGM-65 upgrade. One of the advantages for foreign military sales customers is stable pricing for the airframe. In the past a small Maverick order could result in high airframe costs. That will no longer be the case. Only pristine missiles are being accepted. Raytheon is refusing any missiles that have been out of cold storage, such as captive-carry missiles. 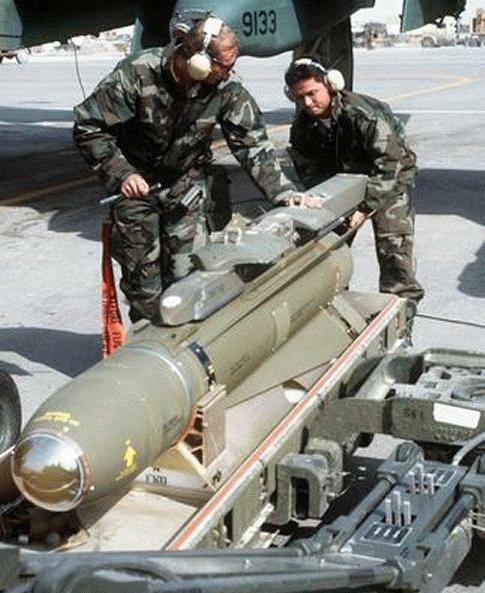 Some consideration is even being given to reuse some parts of the AGM-65A. 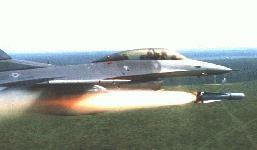 In addition to its combat missiles the AF will also receive upgraded training missiles. Although the Raytheon/AF agreement allows the AF to move forward with the CCD upgrade, the scope of the program is much smaller than first planned. The AF was hoping to upgrade about 2,500 missiles, about 50% of the requirement Air Combat Command has articulated. Contractors: Hughes Aircraft Co., Raytheon Co.
ANNEX F Common Solution/Concept List (U) Air Force Mission Area Plan (MAP) [as of 11 July 1997 - Rev 10] - Detailed and comprehensive Air Combat Command descriptions of weapon system modernization efforts required to satisfy known needs.